We are so excited that you've chosen us to document your special day. We try our best to only work with couples who are downright awesome + who make us genuinely excited to work with them. That's YOU. As your wedding photographers and friends, we're totally here for you throughout this process. While planning a wedding is fun + exciting, we know it can also get a bit hectic + confusing sometimes. And the way we see it, we're not just there to photograph the day as it unravels, we're also there to help ensure the day unravels the way you've dreamt. We want you to celebrate with joy + confidence (+ awesome photos). In addition to all of your Googling + Pinterest-ing, we would love for you to use this as a resource throughout your planning process. Not only do we think reading this guide can take away a bit of uncertainty + stress, but it'll also help us in our efforts to provide you with amazing photographs. Take a scroll + check out some of the information we've put together to help you through this wonderful/weird/exciting stage of your life. And as always, feel free to reach out to us if you have any questions (or just wanna chat/hang out). We want you to be open + honest with us. We need to be invited into your intimacy to capture you authentically. Try your best to be true to who you are. Embrace the vulnerability of each moment + don't hide what makes you unique as a couple. Whether you're goofy, adventurous, quiet, laid back - we want to see that. Let us experience your outtake moments that you usually only share alone. We're totally there to guide you through all of this during the shoot, but we'll need you to meet us halfway + let us in. Wear clothing that you feel comfortable + confident in. You don't need to dress up because this is an occasion (unless you want to!) - again, we want to capture who you are authentically. So wear your favourite sweater, dress, pair of jeans or sneakers. We do recommend avoiding big logos, but we love a good band T. Don't be afraid of sporting a wide-brim hat, or flaunting statement accessories, or rocking neutrals if that's what reflects you best. Whatever. You do you. Just remember the terrain we'll be in + the weather we may have when you're picking your clothing + footwear! It can be difficult to be your sweetest selves after a stressful day of running errands. On the day of our shoot, spend some real time together. Relax, stay in bed to cuddle a bit longer than usual, go to your favourite bar to grab drinks. We don't want this to just be something you're crossing off the to-do list, we want you to have hearts in your eyes + be filled with excitement when your session comes around. Indulge in each other + help us to capture you on your best day. Minimalism is key. Spontaneous shooting is tough when you're lugging around bags, big key chains, and water bottles. We just want you to be light on your feet so we can catch all the little in-between moments. In saying that, we totally welcome the idea of little props to make this session more you. A flask of your favourite beverage, camping mugs, a Navajo blanket. Luckily there's two of us, so if there's an item that's important for you to bring, we're happy to help. You don't need to act in any way you think you should. You're not here for us, we're here for you. We're here to document a really exciting stage in your life. Forget the photo shoot part. Just focus on enjoying your time celebrating this milestone together. Let the dirt, pebbles, + branches get you messy. Let the wind tousle your hair. If it rains, we're just going to get wet. We want to avoid stopping between shots to fuss over your outfit, make up, or hair. We just want to have fun + keep it natural + honest. Let go + embrace those spontaneous elements! bring it, cheers it, drink it. Having a drink (or smoke!) before we shoot can help you unwind + get you in the right state of mind. How long do you need for getting ready photos? Folks getting hair and make-up done: Alex likes to meet up in the last 1.5-2 hours of getting ready. This gives her time to take detail shots (wedding dress, shoes, invites), photos of you popping champagne + hanging out with your wedding party, the final touches/touch-ups of hair and make-up, and putting on your dress. If one of you isn’t getting hair and make-up done: Adam likes to meet up in the last hour of getting ready. If both of you are getting hair + make-up done, but still getting ready separately: both of us will be starting around 1.5-2 hours before you leave for the ceremony. If both of you are getting ready together (which we love), we’ll arrive together and it’s best to plan for 1.5-2 hours before you leave for the ceremony. What’s the deal with a first look? A first look is when you and your partner share a private moment together before the ceremony (as opposed to seeing each other for the first time on the aisle). We personally love first looks for the following reasons: it adds another dimension to your wedding photos; it’s another opportunity for us to get candid, emotional shots of a very intimate moment; it gives you time to revel in the excitement together in a private setting (a bit nervous about being vulnerable in front of people during your ceremony? Let it all out during your first look instead); it takes away some of the nerves so you’re a bit more relaxed during the ceremony; lastly, it allows you the opportunity to plan your timeline so that your portraits, wedding party photos, and family photos can all take place before the ceremony (this means that everyone can just start partying immediately after the ceremony – no waiting around)! To demonstrate this last point, take a look at the timeline examples below + compare how long your guests would have to wait between the ceremony + the wedding party arriving at the reception with + without a first look! How do you guys feel about receiving lines? As always, you do you. But if you want our personal opinion, we prefer a more casual post-ceremony cocktail hour or just spending meaningful time with your guests throughout the entire celebration. Receiving lines take about 20-30 minutes of your time after the ceremony and we think that time can be used just as effectively and in a more relaxed, enjoyable way at the reception. If it’s important to you and/or your families though, that’s all that really matters! When and where do we schedule family photos? Right after the ceremony (it’s easier to keep everyone together than to try to get everyone together) and a location at/around your ceremony site. It can be challenging enough to gather family members who just want to mingle and move onto the reception without having to transport them all to an entirely different location. When it comes to family photos, simple and efficient is the best way to go. How long does it take to do family/wedding party/couple photos? On average, family and wedding party photos take about 30 minutes each. This timeframe can change depending on group size and doesn’t include travel time if you decide to go offsite for wedding party photos. It’s also worthwhile to note that if you have room to schedule more time with your wedding party, do it! After our portrait session is complete, consider planning some downtime to hang out with your best friends – grab something to eat, go for drinks, take a load off. Those make for awesome photos too. We recommend scheduling 45-60 minutes for couple photos – this can also be split into separate sections of the day (we love having the option to steal you away from the reception for a few minutes for sunset photos while the light is killer). It varies depending on the kind of day you're planning, but here are two example for a wedding with an afternoon ceremony (with + without a first look)! There are a ton of things going on throughout your wedding day. With that many moving parts, it can be easy to lose sight of what's most important. We've compiled this list to help keep your priorities in focus while creating beautiful moments + photographs you'll cherish. Before you really dig in to anything else, each of you should ask yourselves: what is most important to me on my wedding day? Share those things with each other. Keep those things in focus throughout your planning process. Make them a priority for each other + remember that big stuff especially when you're sweating the little stuff. It'll help put everything into perspective. If you're close with your grandparent(s) + they're at your wedding, remember to share in moments with them as well. A lot of grandparents leave pretty early into the evening so try to talk with them after the ceremony and/or before the end of dinner. If you're being walked down the aisle by someone important, take a minute to give them a hug + tell them you love them. They're walking with you for a reason + it likely means a lot to them as well. It'll go by in the blink of an eye so try to be present + savour the moment with that person. Keeping your guests in the moment will help keep you in the moment (+ help us to get amazing photos). We highly recommend asking your guests to leave their DSLRs at home + iPhones in their pockets during the ceremony. Remind everyone that you've hired professionals to photograph the day, so you'd really appreciate if they unplugged during the ceremony + just stayed present in the moment with you. It can be helpful to make a note of it in your invite/website + ask your officiant to mention it before the ceremony. The little details are nice + add style, but don't forget that they're exactly that: little. On the day of, it's time to take a deep breath and stop stressing about the centre pieces + decor. When you look back on your wedding day, those are the last things that'll seem important. Everything will come together beautifully, even if it's not exactly how you planned. This whole day is yours. When creating the schedule for your wedding, remember to pencil in enough time to breathe it all in. Have you scheduled in enough quality time with your new husband/wife? It sounds too obvious, but the majority of your wedding day is actually spent being around others, socializing with guests. We encourage our couples to set aside at least one hour for photos of just the two of you. Not only does this give us more freedom as photographers, but it also gives the two of you time to pay attention to each other + really soak it all up. Another opportunity to spend time alone is a pre- or post-ceremony exchange (whether it's a song, letters, gifts, or just being together). Write out your day with start + end times of all events that are happening. Then go back to add at least a 15-30 minute buffer on everything, especially travel time. This will help to avoid situations like stressing out + rushing to the ceremony. We promise you won't regret having extra time to sit around with your wedding party, hang out with your new life partner, or just take a couple of deep breaths. You've hired us as photographers because your wedding photos are important to you. At least we hope so, because they're incredibly important to us! We consider ourselves story tellers + we want the story of your day to be told beautifully + under the best possible conditions. Some things on a wedding day are inevitably left up to fate, but there are some little things you have control over that will help us get the best possible photos of your day. The beginning of your wedding day story is so important. You've surrounded yourself with people who mean the most to you + you're preparing together for one of the most important days of your life. This time provides your photographers the opportunity to capture genuine, quiet moments in an intimate setting. If you're not getting ready at home, consider exploring outside the realm of the standard hotel room. Hotel rooms often create distractions in your photos, like big air conditioning units + glowing exit signs. Instead, browse around online for a cool AirBnB or cabin. Unique locations can make all the difference + will inspire some beautiful shots. Interesting surroundings where you're getting ready can also help us to capture all the little details beautifully, like your dress + printed invites. Besides providing you with charming surroundings, a great location should also give us great natural light. We're talking big windows, balconies/decks, + neutral wall colours. We'll likely ask you to turn off the overhead lights in the room so make sure it's decently lit without them. We won't be the only people loving you for it - your make-up artist will too! Getting ready by a big window does wonders for photos, but it'll also ensure your make-up looks even + natural in the different lighting situations throughout the day. The final touch for perfecting your getting ready photos is striving for minimalism. It's totally normal for the morning of your wedding to get a bit messy but if you'd like to have cleaner looking images, it might be a good idea to ask your wedding party to hide away the unnecessary clutter before your photographers arrive. Again, we're obsessed with natural light + will always root for venues that will provide us with lots of it. If you're planning to have it outdoors, we highly recommend finding a shaded location. On a sunny day, you'll be grateful for the shade as it'll save you from squinting through your vows + guests from melting away in their suits. Whether or not shade is an option, our most important piece of advice for outdoor ceremonies is to ensure the couple (and guests, if possible) are all subject to the same light (either all in shade or all in the sun). That helps us to provide you with balanced images. Remember to think about the time of day when planning your outdoor ceremony. We're totally prepared to work under any conditions, but consider the following: the sun's placement in the sky will affect where/when you'll find shade + the time of day will also affect what kind of light you have, period. Afternoon light is typically harsh + creates uneven conditions, while the final hours of daylight are much softer + flattering for skin tones. You'll want to consider what's behind the altar for outdoor ceremonies as well. We'll try our best to keep distractions out of the frame, but it's worth it to ensure it's not a spot where cars are parked or construction is being done in the distance. If you're planning an indoor ceremony in a church/community hall/etc., make sure to inquire about their photography policies. Some venues restrict movement + have only a few specific spots we can shoot from. It's important for you + for us to know what we'll be able to do during your service. Lastly, space is key + you'll want to ensure there's room for us to move freely so we can capture everything from different angles without disturbing your guests. Give some thought to where + when you're going to do portraits. Try to take advantage of awesome locations that also offer beautiful light. If you don't have anywhere specific in mind, we'd love to do some scouting to find areas nearby. We'll send you some ideas + together we'll find the perfect fit. As for when to do portraits: sometimes they just have to be taken mid-afternoon + that's okay, but it's worthwhile to plan an additional, shorter session later in the evening. If it's possible to sneak away from your reception for 30 minutes, we can take advantage of the soft, dreamy, end of day light. It'll add some dimension to your set of portraits, but our favourite part? It provides you with another opportunity to take a break from being surrounded by other people (as much as you may love them) + spend some quiet time (almost) alone together. This is the part of your wedding day where you probably have the most control over your lighting. The sun has set + taken its unpredictability with it. Whether you're indoor or outdoors, the lighting you've decided to use sets the mood. And we're working with the energy of the room + playing with the light to create your final photos of the evening. We favour warm, romantic lighting + lots of it. Twinkle lights + candles sprinkled around your venue, highlighting your decor + covering the wall behind the head table. Edison bulb string lights providing overhead lighting that's both dreamy + flattering. DJ lights can be fun, especially once you + your friends are showing off your best dances moves. However, we strongly suggest asking for certain colours + features to be turned off at least for the first dances. Specifically, those peppered lights that cover you in dots, neons, and/or any other colours you wouldn't want as the overall glow of your photos. If you're having a summer wedding, dancing under the stars is always unforgettable. Amazing atmosphere can be created using the right lights + nature can also be utilized for your decor in the coolest ways. Setting + staying within your wedding budget can be one of the most challenging aspects of planning your big day. It’s tough to find the balance between wanting the very best for this exciting time in your lives + remembering the importance of managing your finances responsibly. Here are a couple tips we’ve picked up along the way that’ll potentially save you some dough + provide you with a little extra wiggle room for unexpected expenses. Crafting up decor is budget-friendly + a pretty great opportunity to personalize your wedding. DIY can also be an excuse to have some (purposeful) fun with your friends. Grab some wine, throw on The Office, + have your wedding party over to help you out. The most important part of DIYing a wedding is to not leave it for the last minute. Give yourself plenty of time to shop for cheaper materials online + allow extra time for potential mistakes/do overs. Make crafting everything together something you'll enjoy doing, not a rush project the night before. This includes close friends/family, but also acquaintances. If you have a family member who loves sewing, ask them to help with dress alterations. Your pal who went to art school would likely be happy to help with creating personalized programs, hand-lettered signs, etc. You probably know some acquaintances from school or work who would be the perfect fit to do your hair and make-up. You can either have these services be provided to you as your wedding gift, or at least be provided with a discounted price. Not only is it particularly awesome to work with people on your wedding day who you already have a relationship with, but most of your friends/family are going to be so happy to have the opportunity to help you + contribute to your day. Shop til you drop + think outside of the box. If you're able to utilize a venue that isn't usually rented for weddings, it'll provide you with unique photos + typically be more affordable than a traditional venue. Consider AirBnBs just outside of the city, conservatories, family or a friend's property, etc. Also consider having your wedding in the off-season and/or not on a Saturday. Lots of venues have a cheaper rental fee for off-season + non-Saturday weddings. After the save-the-dates + invitations come the programs, place cards, menus, guest book signs, etc. See above for our first tip on how to save with these (recruiting a talented friend, or using your own design skills). If that’s not an option, you can now purchase really charming + affordable designs online. Browse around on Etsy + you may come across the perfect design for the vibe of your wedding. Look for the option to purchase the digital files, personalize them on your computer at home, + have them printed locally. VistaPrint is another option that provides you with a ton of designs + paper stock to choose from, plus they take care of all the printing for you! Being picked up + driving to the venues in a limo or classic car is fun, but not a necessity. Have a family member or friend be your chauffeur for the day – they’ll appreciate the opportunity to hang out with you + it’s an easy way to save. Driving together in your own vehicle is also another excuse to get some alone time. If you have a rewards credit card, use it! Do some research to ensure you have one that offers the most beneficial rewards for you (travel vs. moneyback) + use it strategically. Don't let using credit let you lose sight of your budget - transfer funds from your wedding savings to pay off those credit card purchases right away. The key here is to take advantage of the rewards + get something back for the money that you'd be spending anyway. Who knows, the funds you spend on your wedding can actually pay for your honeymoon too! Costco! Who doesn’t like to hear the word “bulk” when discussing liquor? 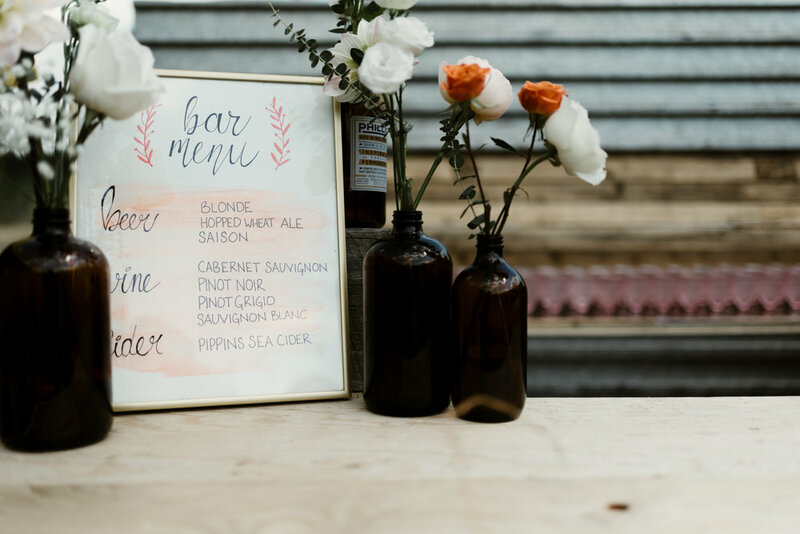 Other tips: consider simplifying your bar by just offering one or two beer + wine options and/or concoct a signature wedding drink as the evening's beverage. Do your research for florists who limit their imports, source locally, + don’t require a minimum order. Substitute expensive flowers for their more affordable lookalikes. Remember that bigger blooms pack a bigger punch so you’ll likely need less of them + lots of greenery will fill your arrangements while adding a ton of style. Also consider limiting the amount of fresh flowers you use outside of your bouquet. Pinterest has lots of inspiration for floral-free centre pieces/decor, but if you still want some floral accents, keep it simple, pretty, + budget-friendly with wild flowers + Baby's Breath. We're sure you want to look like the most beautiful version of yourself on your wedding day, but we also want you to feel like it too. Starting early, planning ahead, + making positive choices will ensure you feel beautiful from the inside out. If you don't own the same shades of eyeshadow, lip stick, etc., most make-up artists will send you along with sample sizes for the day. If not, make sure to ask in case you need a touch up. Even if you don't think you'll cry, always go for the waterproof mascara. Whether it's regular massages or just taking relaxing baths, make time for regimens that are personal to you leading up to the wedding. Well, you should do this all the time. But especially in the months leading up to your wedding + on the day of. Drinking loads of water will do wonders for skin + you'll quickly notice the changes in how you feel. Limit your intake of sugary pops/juices + keep a water bottle with you as often as possible. It's easy to forget things like staying hydrated on your wedding day, but plan ahead to have water readily available to you at all times. It'll be a saving grace with all the talking you'll be doing + keep you energized throughout the entire celebration. Make-up + hair trials, brow shaping, mani/pedi, hair removal, hair cut + colour. Schedule your appointments well in advance + pick dates strategically. Take advantage of when the treatment will look best + leave time to correct any potential mishaps. e.g. your nails should be scheduled for just a couple days prior (before they chip + grow out), but your make-up + hair trials should be several months before the big day. Consider also scheduling your make-up trial with your engagement session so you'll know how it looks in photos. Just some additional miscellaneous tips + tricks for planning your day for optimal fun (for you + for your guests). + some are things we've noticed from the many different experiences we've had. Often times, the officiant will remain in the same position throughout the whole ceremony + their face will end up in the photos of your first kiss (their eyes peeking behind your shoulders or in between your foreheads). We think it can look kind of awkward + it’s an easy fix. Ask your officiant beforehand to take a couple steps aside at that time. We’ll also try to sneak in a conversation with them prior to the ceremony + request it as well. The moment just goes by so quickly + we want you to have a photo of it that is really just the two of you. We love first dances, but we’ve had a lot of feedback from couples that suggests they exist in a vacuum where songs last much longer than what 4 minutes should feel like. If you’re having more than one first dance (e.g. parent dances) and/or if you’re hesitant of being in the spotlight too long, consider working with your DJ to have the song(s) fade out at 1.5-2 minutes. Alternatively, for the married couple’s first dance, you can have the DJ/MC ask the crowd to participate about 2 minutes into the song by lighting sparklers, blowing bubbles, etc. It’ll renew your guests’ attention + make for some amazing photos. It's totally okay if you want to have a child-free day or a child-free reception. We've been seeing an increase of this request recently. Whether it's because you just want to have an uninhibited celebration with friends (some of whom are parents), it's due to budget constraints, or you're just not planning a wedding that would be age appropriate, it's your day. Let your guests know by saying something like, please note that invitations are directly addressed to invited guests. While we wish we could extend an invitation to everyone's children (and/or significant others), we kindly ask for your understanding. Guests can get tuckered out after a long day of celebrations + this is particularly true for those who don't dance at the reception. If you want to have your guests engaged + enjoying themselves late into the evening, late night surprises are perfect for re-energizing! They can take the form of a performance, game, or activity, but usually comes as a snack - which we are so into. The best part is that you can be more casual if you want to. Think about your favourite things to eat when you've been drinking + dancing all night. Pizza, french fries, ice cream bars. Get creative + have fun with it. Even if you're nixing the limo, consider if it's within your budget to rent a shuttle for group transportation. This may be particularly helpful if you're having a wedding in a remote location. You can arrange for a shuttle to pick guests up from a central location (or the hotel most people are staying at) + have the shuttle come back to the reception at one or two times later in the evening to bring them back. This could eliminate or lessen the fees of cab rides, but our favourite part is that it can prevent irresponsible driving + gives freedom to the usual designated drivers. All your guests can drink, be merry, + get home safely! If there will be children at your wedding, there are some little things you can do to keep them engaged. Sit them together if possible + set up activities at their tables, like colouring pages. You can also put together some kid-friendly games close to their table for after dinner as well, like ring toss, spike ball, a disposable camera scavenger hunt, candy piñata. Keeping the kids busy allows parents more freedom to celebrate with you - everyone will be happy if they kiddos are too! Our final, most important pieces of advice for you. Plan a unique day that represents who you are as a couple. Gone are the days of needing to follow any sort of tradition. If you’ve always wanted a traditional wedding, go for it. But either way, take some time to question if that’s what YOU really want or if it’s just all that’s ever been presented to you. Ask yourself if the different wedding traditions actually mean anything to you personally. Rings, first dances, giving away, tosses, cake cutting. These are all lovely traditions but are ultimately unimportant to the day if they’re unimportant to you. Celebrating this time in your lives in a way that’s meaningful to you will ensure you live a day that is uniquely you + that you’ll remember fondly. We will also love you for it because we want to see you happy on your own terms + it’s also so fun + inspiring for us to capture unique weddings. Remember the Niagara episode of The Office? Channel your inner Jim + Pam. Don’t let a veil tear ruin your day – cut the groom’s tie + take all hiccups together, in stride. And this fun, hectic, beautiful day will go by in the blink of an eye. Remember to stop every once in a while to breathe it all in + take those mental snapshots. Click. We'll be asking you to fill out the following two forms in the couple of months before your wedding day. You'll get an email from us requesting the information + we try to give you plenty of time, so don't worry about having to remember on your own! But if you're the type to pre-pre-plan + want to know ahead of time about the details we'll need, take a peak!